A Three Ingredient Chocolate Cake! Couldn’t be Easier! 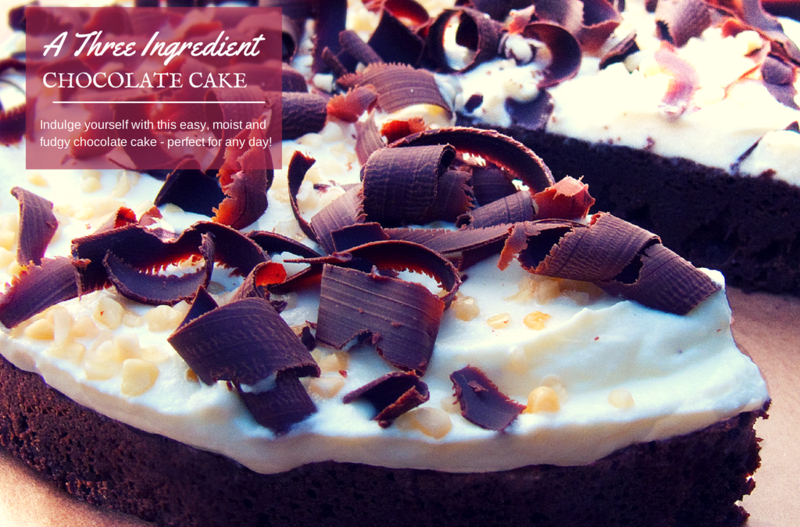 Indulge yourself with this easy, moist and fudgy chocolate cake – perfect for any day! Your best friend when you crave something easy and want to eat something delicious. I´m sure you had chocolate cake before, but seriously have it been as simple as three ingredients (literally!) ? This cake is a mix between fudge, ordinary chocolate cake and chocolate truffle, but less sweet and heavy. Try it, it won´t disappoint! A Three - Ingredient Chocolate Cake! Leave to cool in the pan, then turn out onto a plate and let cool completely in the refrigerator. The cake will be a bit fluffy when hot, but will dip when cooled, this is the desired consistence! I serve this cake with (2,5 dl) whipped cream and decorate with grated or a pile of chocolate curls. I highly suggest you add some liquor or orange to your wiped cream. It´s seriously delicious! 1 tbsp of orange juice, 1-2 tsp of orange zest and 1 tbsp of powdered sugar. Note that this will be added after you have whipped the cream until the consistence you want. If you want to decorate your cake with cream, as picture. Whip your cream until it is no longer is runny.